We met up with the guys from hiphopgamershow.com at PAX East. I love these guys. We’re at about 35:00. I posed this question to the prog-dogs, and you’ll find their responses here. The Naughty Dog Live panel at PAX East went off without a hitch. We got a great response and lots of compliments. Fans told us that we were really the only guys at PAX showing fans the Behind-the-Scenes stuff, rather than just an advertisement. Sadly, the theater we were in couldn’t accommodate even half the fans and media who wanted to get in. 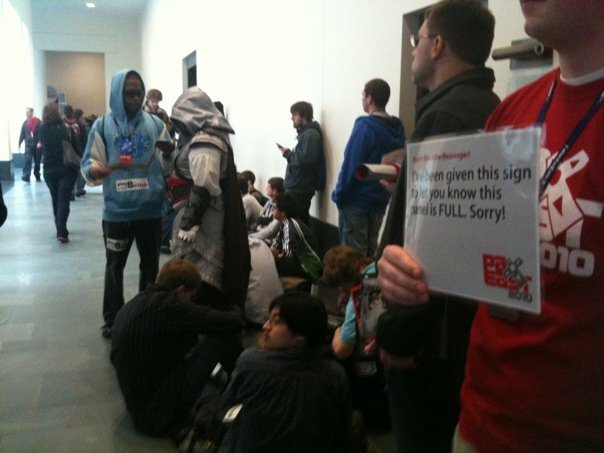 There was a line forming 2 hours before the panel and the theater reached max capacity 1.5 hours early. Justin Richmond, Richard Lemarchand, and I spent some time at the end of the line, apologizing to fans who couldn’t get in. While we were standing there, Jerry Holkins walked by and we started chatting. Apparently we have paparazzi because this got posted on Youtube. Oh, and Steven Totillo of Kotaku was quite taken with my handmade Naughty Dog blazer. Today, my very own Kotaku article, tomorrow, Go Fug Yourself! Come take a peek into how we get games made at Naughty Dog. Three Naughty Dog game designers hold a game design meeting right in the middle of PAX East to tackle the challenge of developing a new gameplay sequence in the UNCHARTED universe, and to make it work for both a single-player campaign and multiplayer modes. We’ll take you through the same highly collaborative, iterative, no-holds-barred design process that went into UNCHARTED 2 – hear us laugh at our own ridiculous design suggestions; check out our terrible drawing skills; witness us engage in, er, “friendly” debate as we overcome challenges! We’ll also take this time to pull back the curtain on what it was like to design gameplay for UNCHARTED 2 and answer questions until we run out of time. Panelists Include: Richard Lemarchand, Jacob Minkoff, Justin Richmond, Arne Meyer. The slides for my lecture are up on the GDC Vault. I’ll be posting a video as soon as possible. Uncharted 2 cleaned up at the Game Developers Choice Awards! All dressed up for the awards show. We won pretty much everything! My talk was part of the career seminar, alongside other indies who’d made good on getting into AAA development. Candace was nice enough to take some pics of me giving my talk. A panoramic view from the podium just before the talk. Those spotlights they shine at the speakers are BRIGHT! Answering questions after my talk. At least 50 people stayed behind to get further information. Comments : Comments Off on GDC!